Well, I am not sure where the warm weather went, but there for a few days we had a hot spell and I was determined to cook everything on the grill that I could. One of my favorite things to do is to cook using foil packets, and one of the best things to do in those packets is fish. In this case I went for tilapia because it was cheap, it looked nice and fresh and it just sounded good. This was an easy prep and a short cooking time on the grill, which was really just a bonus to how good it tasted. 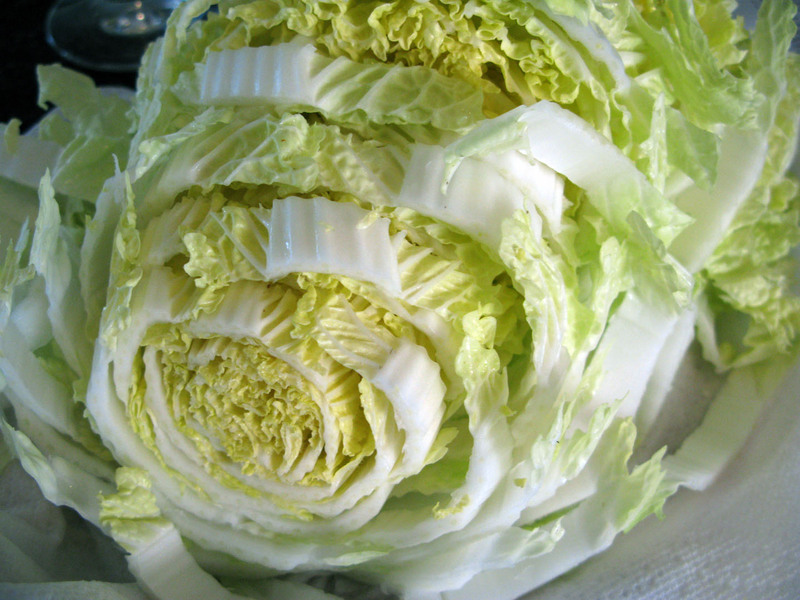 This is from an Epicurious recipe that I modified. They called for flounder. I called for tilapia. Arrange foil pieces over a shallow baking dish or pie pan, sort of lining the pan to create a bowl-like space for your ingredients, leaving an overhang that will be sealed up to create your packet. Divide shallots and garlic equally and sprinkle into the foil "bowl." Put two slices of lime and one slice of orange into each packet. Put 1 tablespoon of butter into each packet. Set a piece of tilapia on top of this and season lightly with pepper and salt. Arrange thyme sprigs on top of fish. Pour 3 tablespoons of beer into each packet. Gather excess foil and roll to seal the edges. 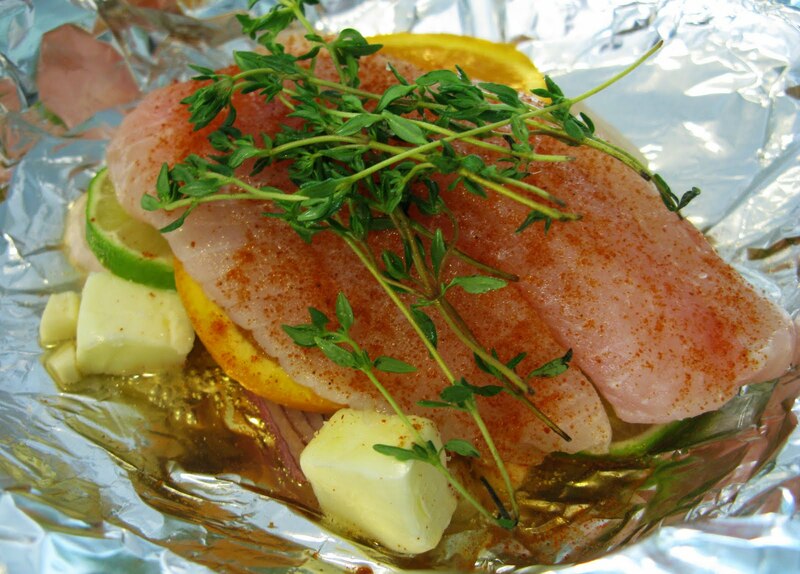 When your grill is heated on medium-high heat, put the packets (seam side up) on the rack and cook 10 minutes. I think if you don't like beer, you can definitely use white wine. If beer or wine is not an option, a little broth of some type probably would work. Or maybe clam juice. I figured there is so little alcohol in the beer and what is there cooks off anyway. The beer and butter make for a nice little sauce that steams the fish beautifully. The cayenne adds just a touch of heat. And the citrus is, well, citrusy and lovely. I served this with grilled white corn and red potatoes that I also had roasted on the grill. My only regret was that I did not have a lovely, crusty piece of bread to sop up that extra cooking sauce. Steak bun - nope, not a sandwich! 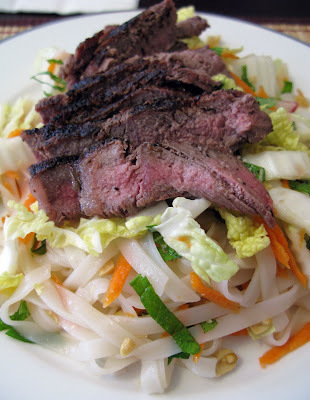 Looking for a cool dish for a hot day, I came across this recipe for a Vietnamese noodle salad in the newest issue of EatingWell. It did involve a fair amount of chopping and prep at the front end. But nothing was complicated and I was able to get this together in about 35-40 minutes. It turned out to be a good option for a warm day. The recipe from Eating Well called for pan-cooking the steak. I opted to grill it. I think I made the right choice. First of all because it meant not having to clean that pan later. Also because I prefer grilled steak. I also added a hit of Sriracha chili sauce to the dressing because I like a little heat. That is up to the maker, I suppose. Cook, turning once, until cooked through to your liking. Let rest on a clean cutting board for 5 minutes. Meanwhile, bring a large pot of water to a boil. Cook rice noodles according to the package directions, until just tender. Drain the noodles and rinse under cold water. Whisk vinegar, fish sauce, sugar and Sriracha to taste in a large bowl until the sugar is dissolved. 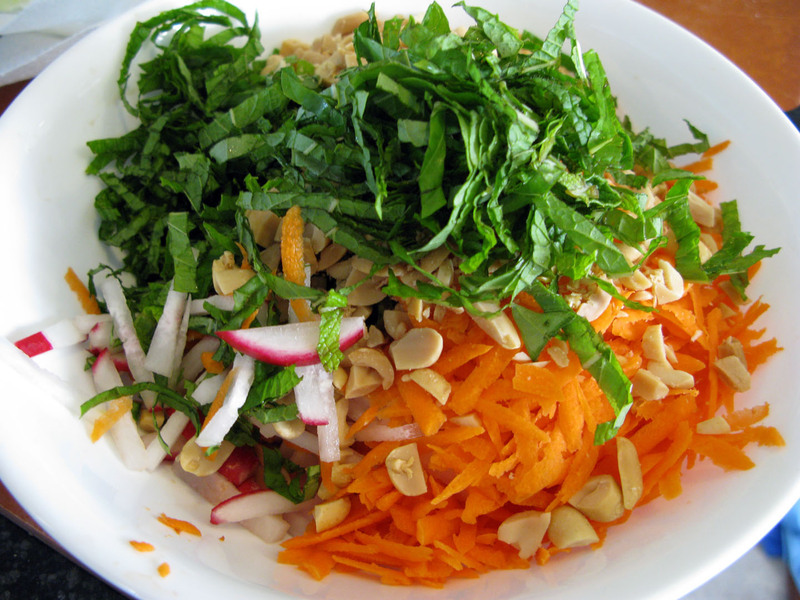 In a large bowl, toss the dressing with the noodles, cabbage, carrot, radishes, herbs and peanuts. Then plate up your portions. Grilling the meat was the way to go. The EW version also mentions sirloin as a possibility. I think this would be good with grilled chicken or shrimp, too. Or even just as a meatless option. 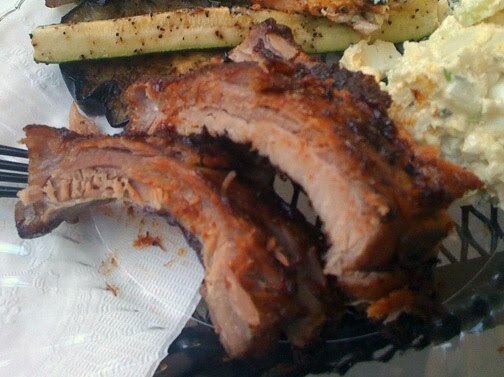 my teeth into those ribs, so I kind of rushed the shot. Living in Southern California, it is pretty much barbecue weather all year long. But summer is, of course, prime season for grilling. And ribs are always a favorite at any cookout. I have tried several methods for making barbecued ribs. The method that yields the most tender, flavorful ribs for me is a combination of a long briny soak, a low-and-slow roasting in the oven then a quick trip around the grill. I also like to use a dry rub after brining and before roasting. Sauce or no sauce is up to the cook. Sometimes I like no sauce, letting the brine and rub shine through. Sometimes I like to use a little sweet, spicy sauce. So yes, these take a while from start to finish, but most of the time is not active time. If you plan on making these, allow overnight to brine and a good 2-3 hours of roasting before you need to grill them. They can be brined and roasted ahead of time and then grilled later. I have done this where I have cooked them on a Saturday and grilled them on a Sunday. It works just fine. In large pot combine water, salt, sugar, spices, herbs and garlic. Simmer and stir until sugar and salt dissolve. Either arrange the ribs to fit into the pot with the brine, making sure they are fully submerged, or arrange them in a single layer in a roasting pan and pour the brine over them. Refrigerate, covered, for 8-12 hours. Combine all ingredients and store in an airtight container until needed. Preheat oven to 325 degrees. Remove the ribs from the brine, rinse and pat dry. Divide the rub evenly over the ribs and rub it into the meat. Arrange the ribs in a single layer on a baking sheet or sheets and cover with foil. Roast for about 2 hours, or until the meat is very tender. Either grill the ribs now, or put them in the fridge to grill later. Get the grill started, it is ready at a medium-high heat. If you use sauce, brush the ribs lightly with your favorite barbecue sauce. Grill the ribs for 5-10 minutes, turning occasionally, until they are done to your liking. I like these with and without sauce, probably a little on the longer end of grilling time. I like them to get a little crispy outer crust on them and the meat inside stays very tender and moist from the roasting. I am that person who can eat soup pretty much any day of the year. I like it in cold weather and I like it in hot weather. I am a soup person. Lately I have taken to making a simple dinner at least one night a week. Often this involves some combination of soup, salad and/or sandwich. I enjoy all sorts of soups, but really like a puree. Cook the bacon in a large stock pot. Once bacon is crisp, remove from pan and set aside. Discard all but about 2 tablespoons of the bacon fat. In the remaining bacon fat cook the onion, garlic and thyme until soft. Add celery and carrots and cook on medium heat about 10 minutes, until soft. Add tomatoes with juice, red peppers and beans. Stir in 4 cups of the chicken broth and cook on medium heat about 10 minutes. Using an immersion blender, puree soup until it is smooth (or to the texture you like). Add more broth as needed to get the texture you like. Put soup back on medium heat and add goat cheese, stirring until cheese is melted. To serve, ladle soup into bowls. 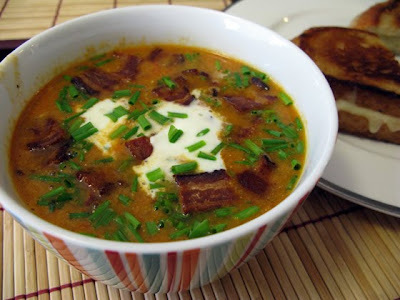 If you like, add a small dollop of creme fraiche or sour cream. 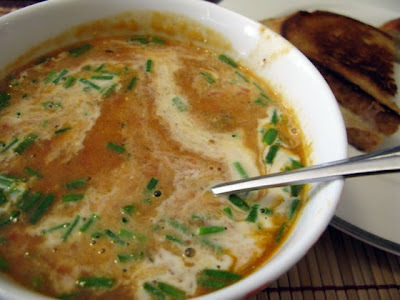 Divide chives and sprinkle on top of soup. Finally, sprinkle bacon pieces over the whole thing. I, of course, added the creme fraiche. I actually got five decent sized servings out of this. For dinner for two at home I paired this with grilled white cheddar sammies on sourdough. The remaining three servings went to my mom, sister and brother-in-law. They all raved about the soup. I am guessing it was even better the next day when they ate it. It is just that kind of soup. 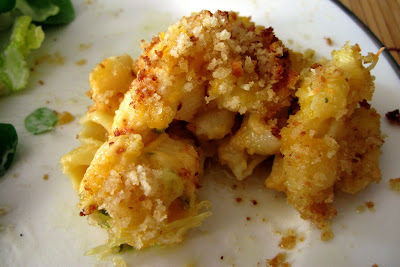 Somehow I made it to the ripe old age of 38 without ever making homemade mac n cheese. I decided to give it a try for a potluck at work. How did I never know how easy this stuff is? Grease or spray a 9-by-13-inch baking pan with cooking spray or baking dish. Heat oven to 350 degrees. Cook the pasta in boiling water following package directions. Drain and rinse; set aside. In a medium saucepan over medium-low heat, melt butter. Add the flour and cook, stirring, until smooth and bubbly. 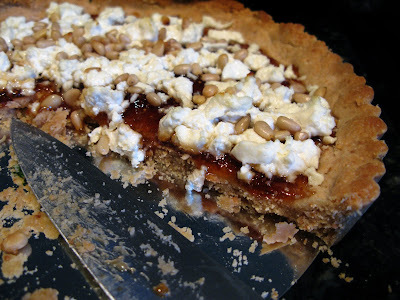 Add the milk or half-and-half and Boursin cheese. Cook, stirring, until hot and thickened. Add the cheese and peppers. Cook, stirring, until cheese has melted. Add salt and pepper, to taste. Combine the sauce with the pasta and stir to blend. Spoon into prepared baking dish. Toss melted butter and bread crumbs together and sprinkle over the casserole. Bake for about 30 minutes, or until bubbly and lightly browned. I like the bread crumbs to be pretty toasty, so I gave it a few minutes under the broiler to get them very golden and toasty. This seemed to go over pretty well at the potluck. I made a big pan of it for that and a smaller pan for Nick and I to have for dinner with a salad on the side. There were no leftovers at all. I used two jalapenos in this, but I think one more would have been good for a little more heat. Or, if you want more chile flavor but not more heat, maybe add in some roasted red pepper or a small can of chopped ortega chiles. 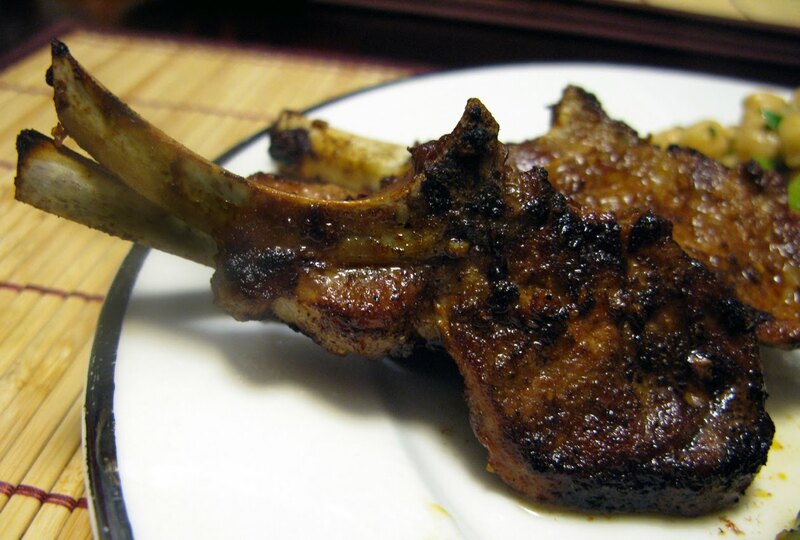 I got a nice little package of lamb at Trader Joe's and decided that I wanted to do something different than my normal grilled lamb chops with redcurrant glaze. I really like the flavor and aroma of smoked paprika, so I decided to try a simple rub with garlic and smoked paprika and then cook the chops in the grill. The chops I used are the small, lollipop type chops. This recipe fits into the 3-4 ingredient category even though it is not from my 3-4 ingredient cookbook. 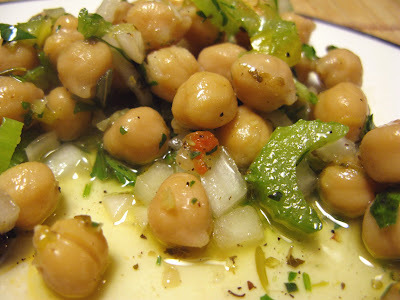 Combine smoked paprika, garlic and olive oil in a small bowl. Rub the chops all over with the paprika-garlic rub and let sit for at least 30 minutes. Grill on high heat about 3-4 minutes on each side. These were really good and really tender. 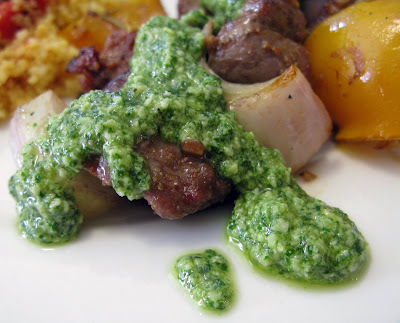 It was a nice change from the sweeter redcurrant chops. 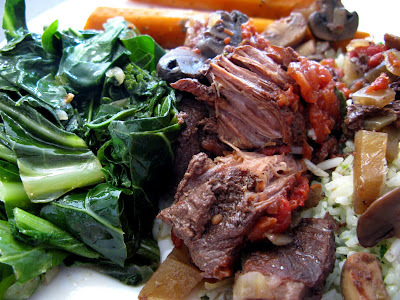 I served the lamb with lemony chick pea salad from Food & Wine's Web site and some sauteed mixed greens. Since I had the baby, dinner is all about what is easy. But it also still needs to be up to my dinner standards. This dish fits the bill perfectly. The lentils are very flavorful and hearty as a side dish. They could be a meal if you are as big a fan of lentils as I am. 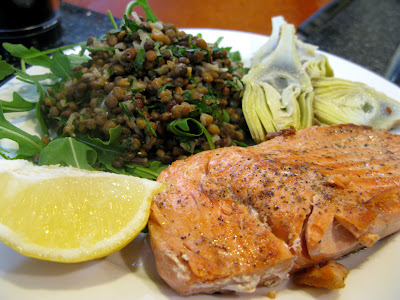 They also would go great not just with the salmon, but with most main dishes. I think a grilled or roasted chicken would be good with the tangy mustard flavor of the lentils. 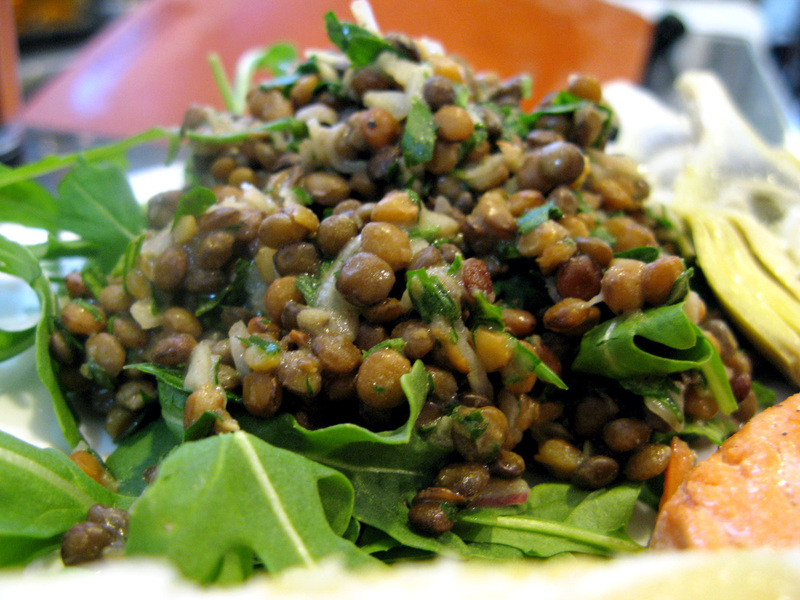 To serve mound about 1 cup of arugula on the plate, spoon lentils over arugula. 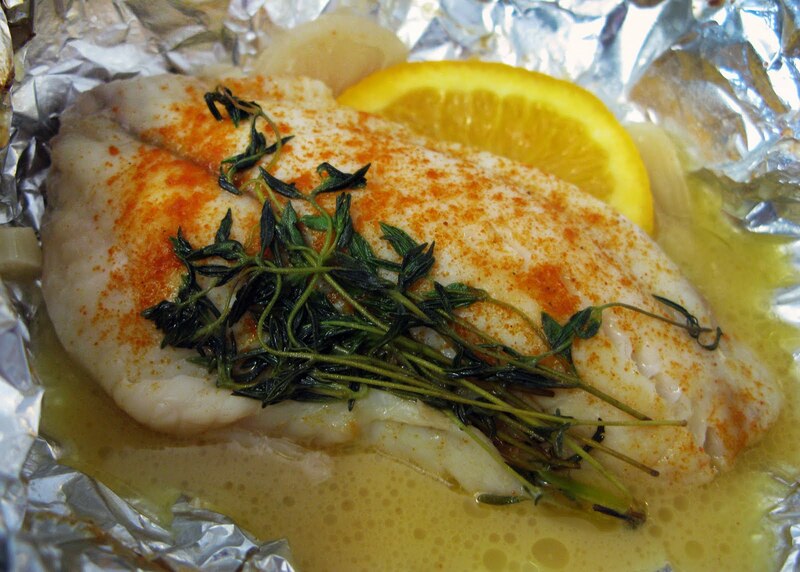 Serve fish on the side with a wedge of lemon. 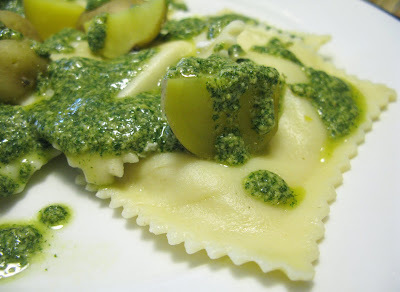 I also served this with some lemon-herb poached baby artichokes that I had left over from the previous night.